My little sister is having a baby. And I get to help her decorate and plan for sweet little Olivia's room. 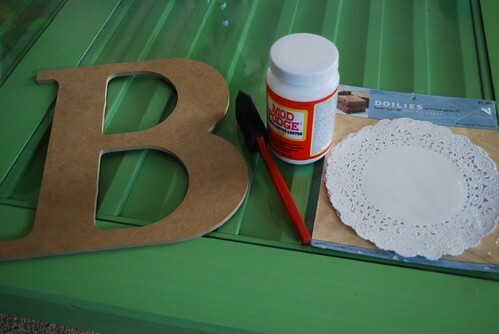 I wanted to make her some letters for her room and remembered seeing some really cute wood block letters decorated with doilies. I couldn't remember where I saw them so I had to do a little pinterest searching and found them here. Click over to check out that sweet nursery. Adorable. There was no tutorial, but I figured they seemed easy enough to do so I just kinda winged it. First take out the center of the doily. 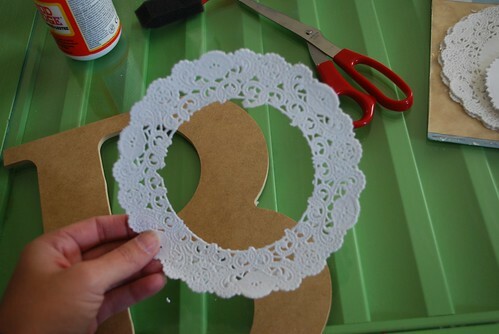 Then decide where you want to place a piece of the doily and cut it to size. 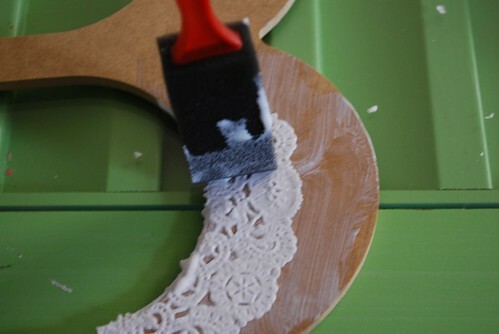 Brush on a thin layer of modge podge and lay the doily on top. 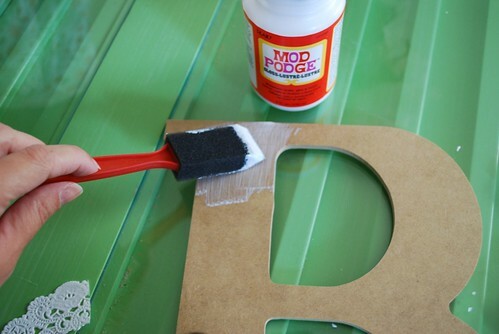 Cover the doily in another layer of modge podge to seal it. 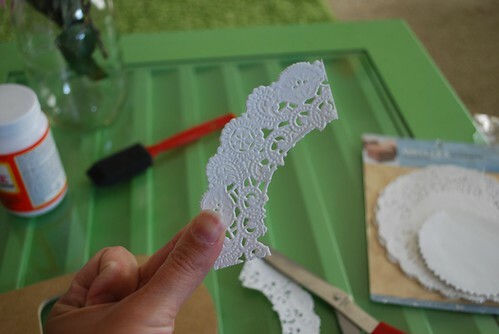 Use the dabbing method on this step as opposed to brushing so you don't tear the doily. I wrapped some of the pieces around the letter and some I cut at the edge. Just eyeball it and decide for yourself where you think you need to place the doily. Super easy and I love the way they look. Simple and Sweet. Can't wait to see them in the room. Thank you to Erin for the idea. We have a few more projects to do so it's my plan to post one here each week. That's my plan. We all know how good I am at sticking to plans for posting, though. But hopefully I'll have a few projects/how to's posted leading up to a whole room reveal. Decorating and creating is a big part of me. I love it. And getting to do it for my sweet baby sister who is having a baby herself? Even better. LOVE that idea! You could do that with lots of stuff ;-) Happy Wednesday! These are super cute! I love the idea! I saw you over at Sugar & Dots! This is soo adorable! My sister-in-law is pregnant and I wish I had time to such sweet projects for her. Congrats to your sister! I love this project!! I found you via The Wiegand's. I have read a few posts and you truly are a beautiful person. I am looking forward to reading more! I'm glad to have met another sister in Christ. a)tell your sis to stop being such a skinny winner when she's pre go. it's rude. I LOVE the letters! They turned out so cute! 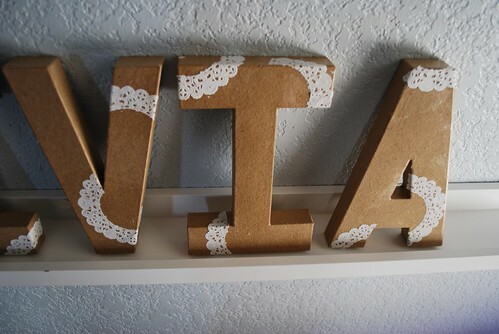 They are one of my favorite things for her room! The best part is her Auntie la la made them for her! How cool is that! Olivia and I are so blessed to have you! they are super cute! :) great job! This is really cute! 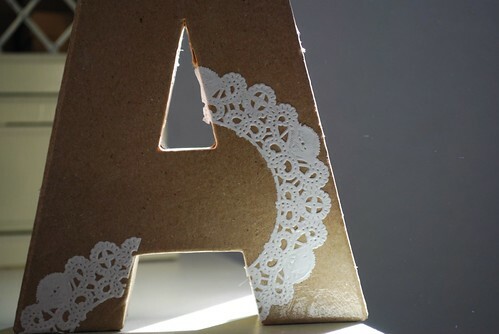 I bought some doilies and I've been meaning to do something fun with them.